Our first full day in Istanbul we hit the big sights: Hagia Sophia, Blue Mosque, and the Grand Bazaar. I’ll get to those things soon, but I am still stuck on our amazing fish dinner the first night! 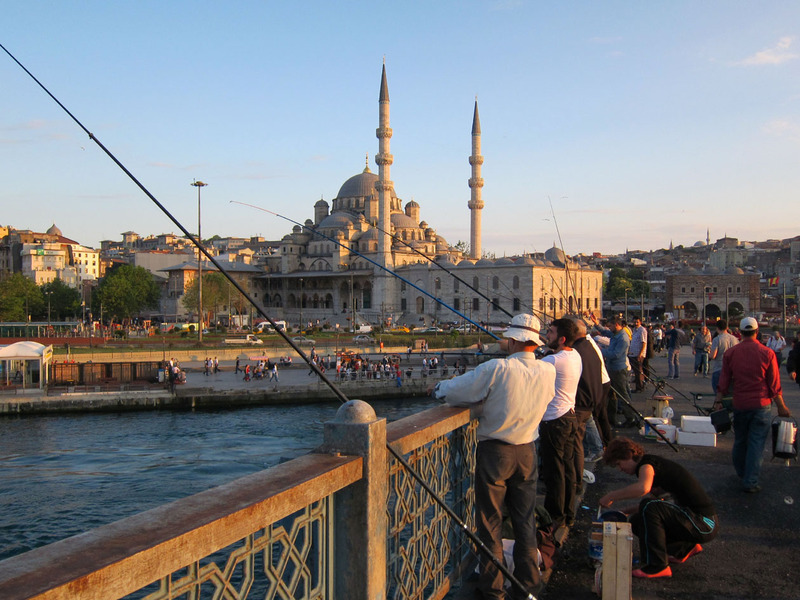 As the sun began to set, we wandered over the Galata Bridge, watching the ferries come and go and observing the local fishermen. Standing almost shoulder to shoulder along the bridge, there were actually catching fish, albeit tiny finger-sized ones. Crossing over the bridge, we saw something set up along the water to the left. It turned out to be a fish market packing up for the day. Men with barbeques were grilling fish for sandwiches while the stall owners threw any small fish and scraps to the waiting seagulls. 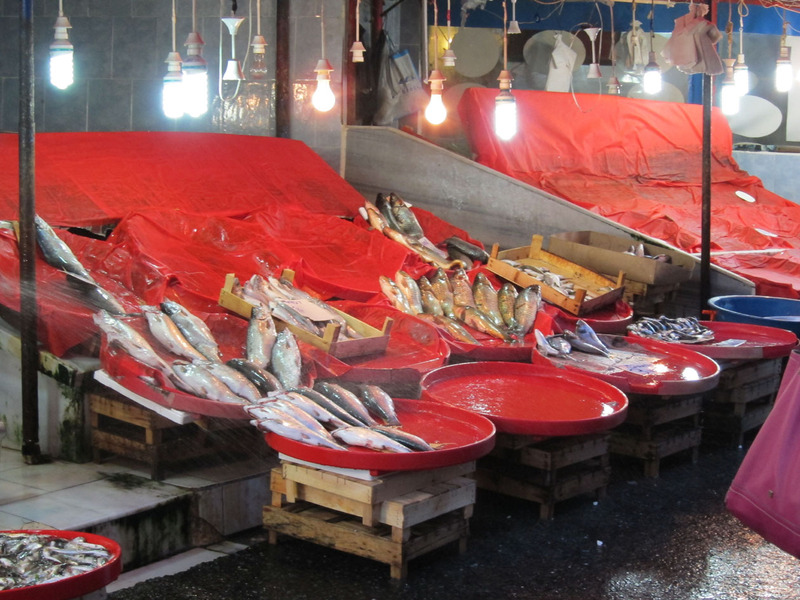 We walked through the market and found about four fish restaurants. It was 7:30pm and they were already busy. We found one with open seating amid a few trees. I heard a little German but by in large it seem like a local spot. Later when I went around back to find their bathroom, it turns out our “restaurant” was just a concrete kitchen shack with grills blazing. It may have looked simple, but let me tell you, it was awesome fish! For dinner, we ordered a fresh grilled mackerel that came plated with salad. The meat was delicate and moist,pairing well with the fresh onion slices. We also had a marinated octopus salad that was tender, not at all rubbery, and swimming in a perfectly seasoned vinaigrette which we soaked up with fresh bread. We also got a plate of fried tiny fish that we ate whole like a cartoon cat leaving only the tail and head behind. This was of course accompanied by a half bottle of Raki and a “büyük su”, or “big water” (an essential Turkish phrase). We lingered for hours watching the sun set and then soaking in the glittering night skyline. I think our grand total for dinner was ~70 TL or $36. I tried to take a picture of the restaurant as we walked back over the bridge but its hard to see. 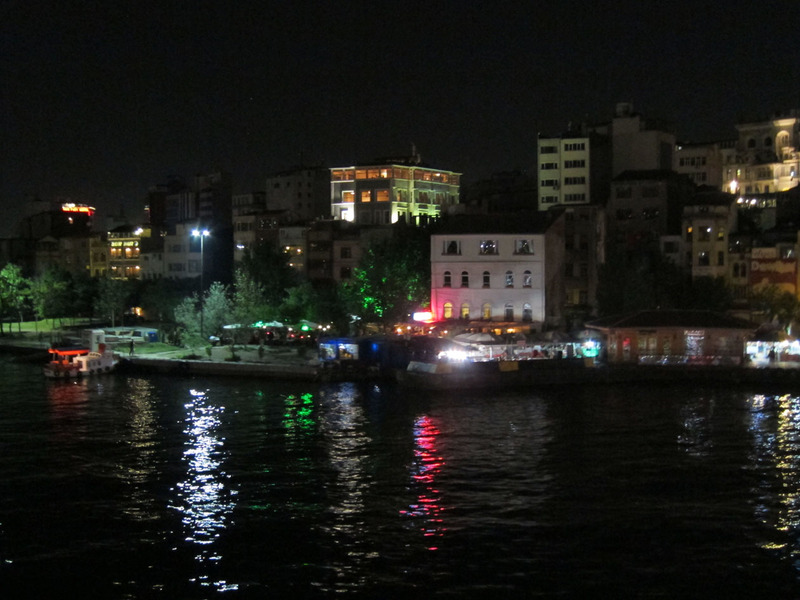 Those small green umbrellas on the left mark an amazing but completely unassuming fresh fish restaurant right along the Bosporus. Like so many of our dining experiences in Turkey, fresh ingredients with simple preparations created a fantastic meal! 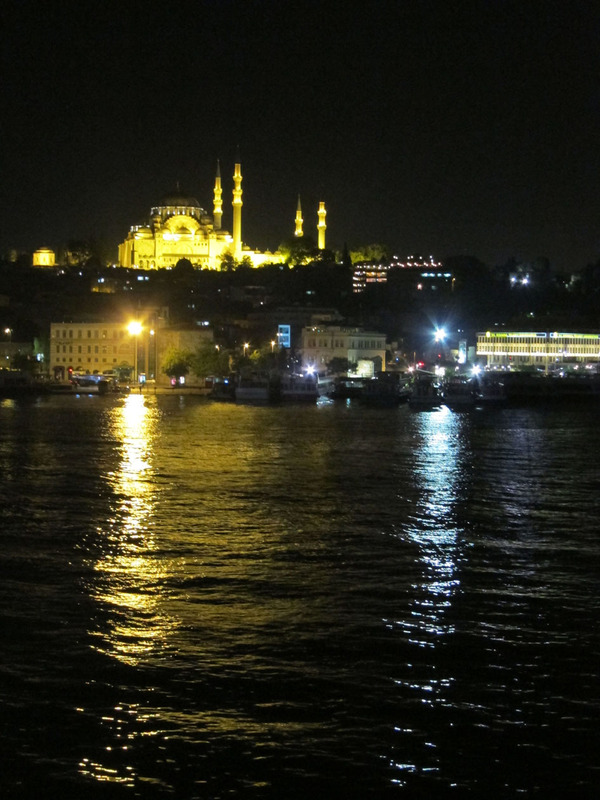 A few days later which checked out the fish restaurants which occupy the lower deck of the Galata Bridge but they were bright, modern and expensive. Fish shack was definitely the way to go.